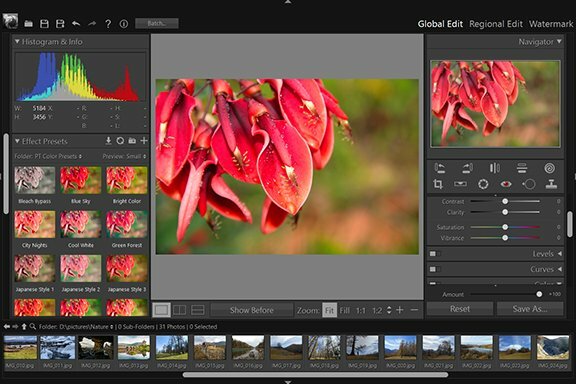 Quick Selection Tool - Regional Edit - User Guide of PT Photo Editor - Easily rescue problem photos. Make every shot its best. 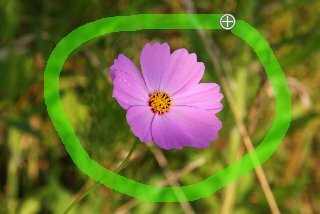 The Quick Selection tool makes a selection based on color or/and luminance when you click or draw a line in the area you want to select. The mark you make does not need to be precise, because the Quick Selection tool automatically selects the area. Select the Quick Selection tool in the tool strip or press "Q". Choose a selection target – Color/Luminance/Both. The Quick Selection tool will automatically select the area based on the target. For example, if you choose "Color", the Quick Selection tool will select the pixels of similar color with your click or drawing. 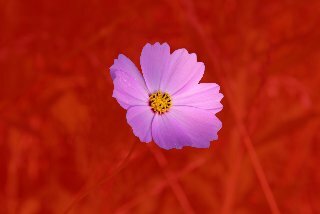 Contiguous Yes: Select only adjacent areas using the similar color or/and luminance. 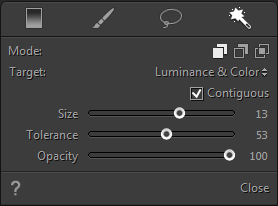 When Contiguous No is selected, pixels using the similar color or/and luminance are selected throughout the entire photo. Drag the "Size" slider or use mouse wheel to specify the size of the Quick Selection pen. For "Tolerance", set a value between 0 to 100. Set a low value to select pixels very similar to the marked pixels, while set a higher value to select a broader range of pixels. Click or click-drag over the area that covers the range of colors in the object you want to select, and then release the mouse button. The selection area appears. To add to the selection, click the "Add To Selection" button in the options panel, and click or click-drag across the area you want to add. To remove an area from the selection, click the "Subtract From Selection" button in the options panel, and click or click-drag across the area you want to subtract from the selection. To make the selection edge soft, click in the selection management panel and input the Feather radius.